This Lickable Treat is made with tender pieces of chicken and beef combined with peas, carrots and corn, in a rich stew sauce. It’s also a great topper for dry food! 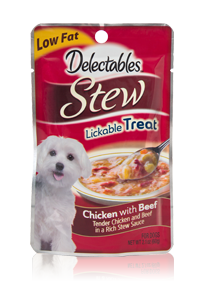 Mixes easily and is sure to have your dog gobbling up every last bite. Tender pieces of chicken and beef combined with peas, carrots and corn, in a rich stew sauce.